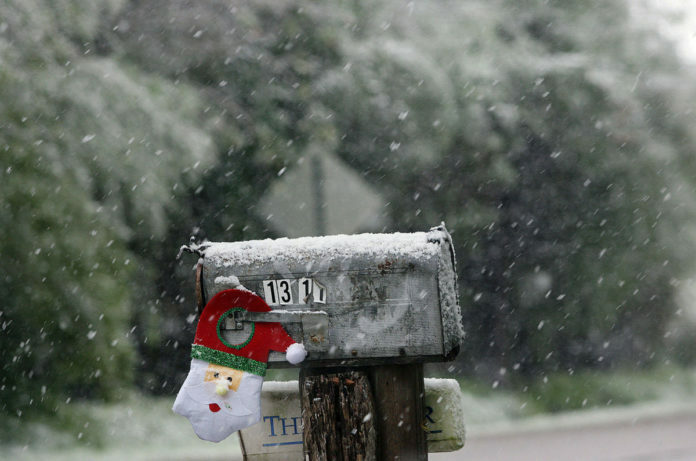 Snow is seen falling on a mailbox Friday, Dec. 8, 2017 in Edinburg. “Remember the winter outlook was warmer, drier than average, with a few cold snaps? And boom! We had a big one,” Barry Goldsmith, warning coordination meteorologist with the National Weather service in Brownsville, said yesterday. “We may not be done with cold snaps,” Goldsmith added. The massive cold front that pushed through from the north last week dropped temperatures to around the freezing mark. This Friday and Saturday, another cold front is expected which could drive daytime temperatures in the Valley into the 40s. The average temperatures in mid-December are highs in the low 70s and night-time lows of about 50. “What we’re seeing here this month is interesting,” Goldsmith said. “We’re seeing the pattern we just saw dropping in again and again but not the same way. It’s so hard to make it snow twice, it’s like lightning striking twice, it’s hard to do. The NWS meteorologist said what is occurring in the Valley is a pattern similar to last year, when we had three cold outbreaks between Dec. 9 and Jan. 8. “And then we warmed up and we never got cold again,” he said. Christmas week, Goldsmith said, another cold front is a possibility but he said forecasters just don’t have the tools to confidently issue a forecast for two weeks out.